Trump's break with tradition may be good or bad, but it's definitely different. The United States is currently experiencing a “historic flow of unskilled immigration,” warned Stephen Miller in a bruising news conference last week that saw the White House senior policy adviser harangue a CNN reporter over the famous Emma Lazarus poem on the base of the Statue of Liberty. Miller, who is also the chief wordsmith behind President Donald Trump’s revanchist agenda, speaks with the conviction of a true believer. It’s perfectly reasonable to revisit American immigration policy, which has remained mostly consistent for over 50 years and favors family reunification over skills-based quotas, unlike many other Western countries. But to claim that the current flow of “unskilled” immigrants into the United States is “historic”—or a break from precedent—is to betray history. The great immigration wave that delivered some 40 million newcomers to the United States between 1830 and 1940 was comprised largely of unskilled workers with minimal English-language proficiency. For every third- or fourth-generation white ethnic family, there is a stunning success story, but in the aggregate, their ancestors experienced little economic mobility in their own lifetimes. Many of them had little interest in even being American; they came to earn money and return home. The proposed shift to a skills-based system might be good for the country; it might be bad. It’s the prevailing system in Canada and Australia, two countries that aren’t known for their hostility to immigrants. But on one important point, Miller is clearly wrong: Trump’s plan would signal a dramatic break with American history and tradition. Americans often think of their history as uniquely providential. But we have always existed in a wider global context. The 19th and early 20th centuries witnessed a seismic economic reordering in which people, capital and ideas flowed within and between national borders. The same forces that drove European and Asian migration to the United States—the rise of commercial agriculture and the attendant trend of land consolidation, industrialization and growing international trade—also generated massive waves of internal migration from rural to urban areas and immigration to magnet countries like Brazil, Britain and Canada. The United States was a major part of a much larger story. Migration patterns varied widely both between and within countries, but for the most part, immigrants to the United States between 1830 and 1940 hailed from areas undergoing fast economic change. The poorest peasants tended not to embark for America, lacking the financial wherewithal to make the journey. Instead, it was more often the displaced landowner or semi-skilled journeyman or artisan—someone who had already made the intermediary migration from countryside to town, and who had at least a modicum of exposure to small-city life—who made the journey. Studies of Italian immigrants in early 20th-century Rochester, Utica and Kansas City reveal a population of families that owned small homesteads in the old country, rather than day laborers or the very destitute. The same trend was evident in other cities and among other immigrant populations. Yet if they weren’t the poorest of the poor, most immigrants were not skilled or educated. In San Francisco in the 1880s, Irish immigrants were five times as likely to be unskilled as the city’s broader population. In Detroit, German immigrants were almost twice as likely to be unskilled workers as their native-born neighbors. In Pittsburgh in 1900, fewer than 10 percent of Polish immigrants and just 18 percent of Italian immigrants were skilled workers. We like to think of America as the kind of place where an unskilled but industrious newcomer can quickly climb the economic ladder. And sometimes it is. But those cases were few and far between a century ago. Most of the country’s first-generation white ethnics arrived as unskilled factory and farm laborers and remained as such in their lifetimes. In Poughkeepsie, three-quarters of Irish immigrants remained unskilled workers until retirement or death. In his famous study of Boston, the historian Stephen Thernstrom found that just 13 percent of working-class residents born in the 1850s—many of them immigrants—clawed their way into the middle class; among those born in the first decade of the twentieth century, only 14 percent. These trends were the norm. Even the most model of “model minority” groups—Eastern European Jews who arrived in the United States between the 1880s and early 1920s—were principally engaged in the unskilled needle trades or as small business owners. Stereotypes notwithstanding, in the 1940s just 24 percent of Jewish men in New York—first and second generation, alike—claimed a college- or graduate-level education. In 1957, that figure climbed to 28.5 percent, and, by 1970, it was 36.4 percent—well above similar educational achievement levels for Protestants and Catholics, but still far short of a majority. While 75 percent of Jewish men in that decade qualified as “white collar,” most were small business owners; only 14 percent worked in licensed professions like law, medicine or insurance. In the same way that immigration to the United States was part of a global phenomenon, it was also usually an economic strategy. 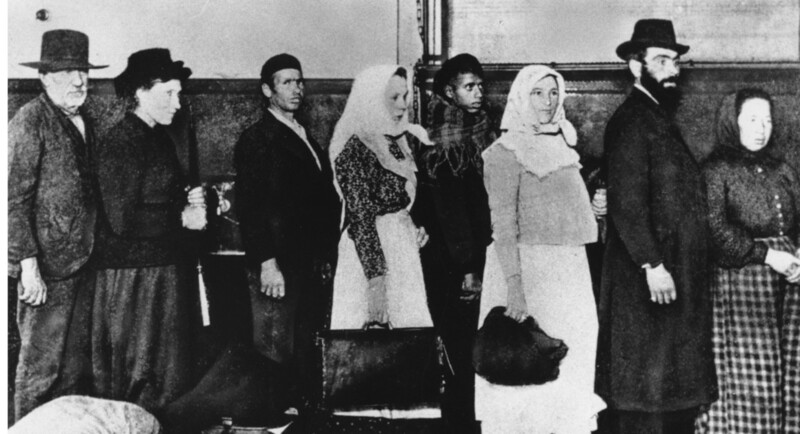 Leaving aside groups like Eastern and Central European Jews, and the Irish, who had compelling economic and political reasons to make a permanent journey, a large portion of immigrants to the United States were “birds of flight”—temporary residents who came to America to work, stock up money and return home, usually with dreams of buying a farm or shop in their native countries. Over half of all southern Italians came and went. So did 64 percent of Hungarians, 59 percent of Slovaks and 40 percent of Germans. We think of that generation as different and special, and for those families that took root in the U.S., they were. (Certainly, that’s how I regard my great-grandparents: with reverence for the sacrifices they made so that I could one day write this article.) But most immigrants came here with mixed and often hardheaded intentions. Some came in search of opportunity and a fresh start. Others came to experience political enfranchisement and personal liberty. But most were not starry-eyed dreamers—they were ordinary people trying to do the smart thing for themselves and their families; in an age when America experienced rapid urban and industrial growth, moving to New York, Chicago or San Francisco was simply a logical decision. Large numbers of early immigrants arrived in the United States without English-language skills. Even among many Irish newcomers in the mid-19th century, Gaelic, not English, was standard. Studies of second-generation Germans in Wisconsin in 1910 found that roughly one-quarter spoke only German. In Chicago in the 1920s, most movie theaters in ethnic neighborhoods deployed subtitles, as large numbers of first-generation residents could not understand English. “I spoke not a word of English when I started school,” remembered Jerry Della Femina, who later became an advertising executive in Manhattan. “But then why should I have? Italian was spoken at home. I lived in a claustrophobically Italian neighborhood, everyone I knew spoke only Italian, so it was natural that I didn’t know English.” Della Femina grew up in Brooklyn—not in the 1920s, but in the 1940s and 1950s. So Stephen Miller got that wrong, too. In 1924, Congress passed—and Calvin Coolidge signed—the Johnson-Reed Act, which swung the doors closed to most immigrants from Southern and Eastern Europe. (Ironically, this legislative act, cruel as it was, went a long way in driving acculturation; without a steady stream of newcomers clad in Old World clothes and speaking foreign tongues, a second generation of accentless English speakers—crazy about baseball and Hollywood—became the new face of ethnic America.) It wasn’t until 1965, at the high water-mark of the Great Society, that Lyndon Johnson and his congressional allies revised the statute. It was the realization of a decades-long dream on the part of urban Democratic congressmen whose constituents—Jews, Poles, Italians, Russians, Greeks, Serbs and other Southern and Eastern European ethnics—had been explicit targets of the 1924 law. The Immigration and Nationality Act of 1965 eliminated hard quotas on countries previously considered undesirable and ushered in a new era of ethnic, racial and religious diversity. Though in its first iteration, the law privileged skilled and educated workers; in its final iteration, it biased family unification. The children, spouses and siblings of legal residents took precedence, along with scientists, artists, professionals and skilled manual workers. In the first years of its enactment, the new law opened the door to large numbers of professionals, particularly from Asia and the Asia-Pacific region. Whereas fewer than 2 percent of immigrants in 1900 qualified as skilled workers, by 1973 roughly 10 percent met that qualification. More than 50,000 physicians and nurses emigrated to the U.S. between 1969 and 1973 alone, most of them from countries like the Philippines, South Korea, Pakistan and China. Within two decades, upward of 80 percent of staff physicians at some New York hospitals were Asian immigrants. The same pattern was on display in other professions, particularly in the STEM fields. In other words, the immigrants who arrived in 2000 came to resemble more closely the immigrants of 1900—not the poorest of the poor, who can’t afford to make the journey to the United States; not highly skilled or educated workers, but often possessed of some exposure to industry or agriculture. Stephen Miller isn’t necessarily posing the wrong question. (I suspect he’s posing it for the wrong reasons, but that’s beyond the scope of this article.) The United States 100 years ago was a nation undergoing rapid industrial and urban growth. It didn’t need immigrants prepared to staff a knowledge economy. It needed a surfeit of hard-working people who could operate a sewing machine, mine coal, produce rubber and steel, dig ditches and build cars—and cheaply. That’s not the America of 2017, and it’s worth having a discussion about how our economy and immigration policy should align. Part of that conversation must surely include acknowledgment that our service economy may require the contribution of unskilled workers, and people willing to undertake unskilled jobs on, say, farms or in fast-food restaurants, to build a better future for their children. It should be compassionate and pro-family—and being pro-family means helping families reunite and stay together. And it should recognize that today’s immigrant begets tomorrow’s all-American kid—and that all-American kid might go on to develop the next broad-spectrum antibiotic or self-driving car. Fifty years ago, the historian Oscar Handlin described early American immigrants as “uprooted”—poor, dispossessed, dazed and ill-prepared to succeed in urban, industrial America. Damaged goods. Later generations of historians challenged this idea. They mined a treasure-trove of primary sources and discovered that immigrants were often savvy and industrious. It took ambition, drive and a high tolerance for risk to transplant one’s self, whether from the Irish countryside to Liverpool or from Minsk to Philadelphia. They were strivers whose children fought world wars and built great companies. You can see their legacy today in the faces of so many millions of hard-working newcomers.